The brand ambassadors for Travers bikes are a collection of riders that covers a wide range of cycling activities from cross country racing to multi day Fat bike riding. The one thing we all have in common is that we all love to talk bikes! Feel free to approach us a races, the team are often present at most major UK endurance events as well as XC races through out the southeast. MICHAEL TRAVERS: Founder of Travers Bikes (He had to call it something). Michael is a motivating force in grass roots racing and custom designed Titanium and Carbon goodies right here in the South’s most mountainous county, Essex. Travers race team manager (apparently it’s like herding cats) and committed endurance rider. You will see him thrashing his titanium prototypes around the 24 hour and shorter XC races throughout the year. He’s been riding since he was 15 year old (six years he tells us) and was, like the rest of the Travers Team Ambassadors an early convert to mountain biking back in the late 80's. We couldn’t figure the maths either. Maybe there’s a split personality in there somewhere? Steve has a reputation for breaking stuff, but is yet to bust anything with the Travers name on it. 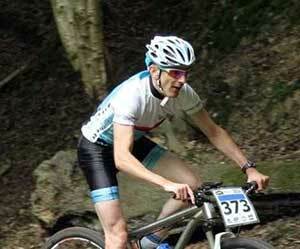 Not only has he made a name for himself as a singlespeeder, but he has given some of the geared boys a bit of a shock in recent years with his ability to get his face at the sharp end of the leader board at numerous endurance events, including taking the singlespeed title at the WEMBO solo 24hr championships in 2016, whilst also managing to finish 6th overall in amongst the Elite boys. Known for his ability to pound out consistant laps hour after hour, but also quick on the technical stuff, especially when the sun goes down. Now running a RussTi 27.5+ with a Lauf front end, and loving it. ROB WILLIAMSON: Rob brings out the calming spiritual side to the team. He rides a Rudy 29er and is most at home as part of an endurance team. He is also well known for his legendary encouragement of other racers out on track whilst he is waiting for his team-mates to return. His talents do not end there, as off the bike Rob is also well known in the local area for repairing broken bodies at The Plumb Blossom Clinic. Russ Welch: Self confessed weight-weenie and bike component Uber-Geek. Russ is renowned for working out the cost per gram of components as well as c﻿﻿﻿alculating the power to weight ratio of a chicken drumstick compared to a flaxseed and hemp organic honey derived energy gel. The unfortunate consequ﻿﻿﻿ence of this obsessive behaviour and attention to detail is that Russ is properly quick and a real contender regardless if he is competing in 24 hour solo race or scorching a trail in an hour long cyclocross event! 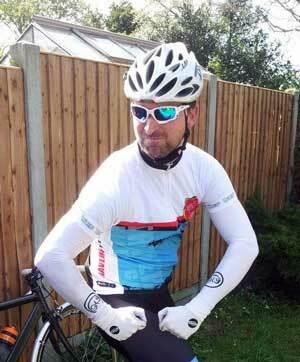 John Moore: A true Northerner who gets scared heading south of Watford Gap, not really a racer but with plenty of KOM's to his name if Strava counts as some sort of racing. A hater of riding on the tarmac but with a target of 5000 miles off-road riding each and every year. A Salesman by day and when not walking the dog, keeping his wife happy you'll find him riding his Fat Bike, 29er+, XC, CX, Tandem, on beaches, sand dunes, hills, canal towpaths, plus bike packing adventures and the occasional Northern and Scottish trail centre.